When you enter the Arizona Historical Society (AHS) Downtown Museum at 140 North Stone in Tucson the first thing you see is a copy of a photograph taken from Sentinel Peak (also known as "A" mountain) in 1880 by Watkins. The print measures 47 X 87 inches and in copying it from a 14 X 21.3 print the AHS printer cropped out some of the sky to give a more panoramic effect. Watkins worked with so-called "mammoth" (up to 18 X20 inches) wet glass plates and the results he produced were extremely detailed and in some respects are unmatched by later photographers. The Downtown Museum image is reproduced below. 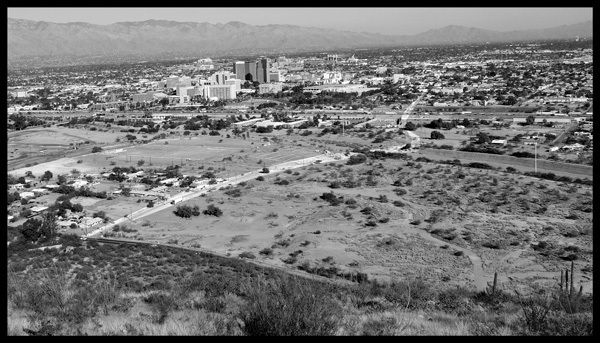 To compare this scene with Tucson in 2007 a Nikon D200 digital camera was used to make the image below. In both photographs Mission Lane (still in existence and highlighted in the 2007 view) is seen going from the lower left toward the upper right. The road makes a jog at the Santa Cruz riverbed and then becomes Simpson Street, which still exists today. 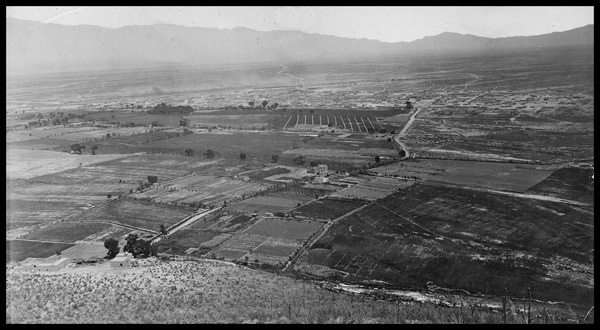 There are plans to restore the old Convento seen in the center of the 1880 view as well as the Solomon Warner house and mill located in the lower left. The AHS photo is a copy of a print so the resolution is probably somewhat less than in the original glass plate but in the enlarged section show below you clearly make out several people and a horse. Jim Blees at the AHS downtown museum points out that these people all seem to be watching the photographer while the horse seems disinterested. A future issue of the Photographica Digest will cover Watkins' career in more detail. Last month's article Carleton E. Watkins, Photographer, The Tucson Connection promised more about Watkins in a future article. Here it is but with a couple of different twists. Born in 1829, Watkins left the place of his birth, Oneonta, N.Y. in 1851 to seek his fortune in the West. By remarkable coincidence his westward traveling companion was a merchant also from Oneonta, N.Y. named Collis Potter Huntington (1821-1900).1 Huntington came from a poor family and worked as an itinerant peddler eventually becoming a prosperous merchant before moving west to Sacramento, CA. Huntington eventually became a wealthy railroad magnate and helped promote the Central Pacific Railroad's extension across the West, making possible the first transcontinental railroad in 1869. Thus began Watkins' lifelong association with the railroad. After a couple of years working as a clerk in a store owned by his friend Huntington, Watkins was employed at Robert H. Vance's photographic portrait gallery in San Jose, where he became proficient in making daguerreotypes. The introduction of the wet collodion process which reduced exposure time, created a sharper image, and was considerably cheaper encouraged many photographers, including Watkins, to begin capturing the spectacular landscape of the region. By 1861 Watkins was working for himself as a landscape photographer. 1861 was also the year in which Watkins made the first of seven photographic trips to Yosemite. There he made thirty mammoth plate and one hundred stereograph views that were among the first images of Yosemite seen in the East. These images reputedly encouraged President Lincoln to sign the 1864 bill that declared the valley a national treasure, thus paving the way for the National Parks system. To appreciate what monumental tasks Watkins' trips to the Yosemite Valley were consider the following. Watkins traveled by wagon, which was pulled by as many as 12 mules often over hazardous wilderness trails. He had to carry a large stereo camera and a so- called mammoth plate (18 X 22) camera as well as glass plates, chemicals, a portable darkroom (tent) and food for several weeks or months. Pictures of Watkins at this time show him to be quite robust which was certainly a requirement for his chosen task. The Yosemite pictures made Watkins one of the most recognized photographers here and abroad. His stereo views were sold widely and his business prospered. Photography and stereo views were the most popular consumer technology of the 19th century. Stereo views became the television of their day. Almost every home had a stereo viewer and basket of cards. Watkins made more stereo images than any other kind and his in particular made spectacular use of the three-dimensional effects. By 1869 Watkins had built a large stock of photographs that was generating a dependable income and in 1871 opened the Yosemite Art Gallery in San Francisco. The gallery displayed 125 of his large Pacific coast views and more than a thousand stereo images. Watkins' career was marked by numerous ups and downs. At times he was hailed as the most important photographer of the day and at other times he was bankrupt, relying on friends like Huntington for assistance. In 1875 a continuing economic slump led to the loss of his Yosemite Art Gallery with most of his original negatives going to businessman John Jay Cook (1837-1904), who had lent money to Watkins. In 1876, embittered by the loss of his Yosemite Art Gallery, Watkins began to re-photograph the places previously visited calling them the "New Series of Pacific Coast Views". Huntington provided a special two rail car arrangement for travel to Southern California, where Watkins began a series on mission architecture and documented the elaborate Tehachapi Loop and other features of the Southern Pacific Railroad.Huntington continued to help Watkins hence the 1880 trip to Arizona to document the arrival of the railroad in Tucson. From 1880 to 1890 Watkins traveled up and down the West Coast photographing agricultural and mining operations. He used electric lights and flash powder to photograph the interior of underground mines. Watkins health and fortunes continued to decline. He was unable to complete a commission obtained in 1894 from Phoebe Hearst (1842-1919) to photograph her Hacienda del Pozo de Verona, near Livermore, California. In 1895 Watkins was again insolvent and lived with his family in an abandoned railroad car for eighteen months. His old friend and mentor, Huntington, deeded Capay Ranch in Yolo County to Watkins so he had a place to live. For the next 10 years Watkins' failing health and eyesight prevented him from recovering financially and the final blow was struck when his studio and all of his negatives were destroyed by the fire that was started by the San Francisco earthquake on April 18, 1906. The web site http://www.yosemite.ca.us/library/watkins/ contains a picture of a white haired, frail Watkins leaving his burning studio with its precious negatives. Watkins is dressed impeccably and is using a cane as well as the arm of a much younger man (probably his son Collis who was named after Huntington) for support. Watkins declined mentally and was committed to the to Napa State Hospital for the Insane in 1907. Watkins died in the mental hospital in 1916 and was buried in an unmarked grave in its grounds. What a tragic ending for a truly great artist/photographer who is being more and more appreciated today. In The Art of Preception (1999) author Douglas R. Nickel writes "------Watkins made photographs that are more modern in appearance than our understanding of art history ought to allow." Watkins' work is found in an astonishing number of museums worldwide. The Etherton Gallery in Tucson has a single example and owner Terry Etherton says that because of the loss of his negatives original prints are seldom found on the open market. An excellent place to view some of Watkins work on line is The National Gallery of Art's web site http://www.nga.gov/exhibitions/watkinsbro.htm. The Getty Museum has more than 1400 images by Watkins of which 67 are on line. The Getty web site is http://www.getty.edu/, however the path to Watkins is a little convoluted. You need to go to "Explore Art" and then "Artist" after which you can select "W" and then "Watkins". If you are doing a web search for more Watkins information I recommend the Scroogle search engine (http://scroogle.org/). Scroogle gives more pertinent results and eliminates some of the loathsome tracking things done by Google. The March/April 2007 edition of the magazine View Camera features photographers working with old cameras, lenses and processes including wet plate collodion negatives and Daguerreotype images. Contemporary wet plate photographer Quinn Jacobson (http://www.collodion.com/) has produced an illustrated book describing the wet plate process, if you are thinking about going this way. Somehow I seem to always find personal connections in my research and this article is no exception. There is a New Jersey road called the White Horse Pike that goes from Philadelphia to Atlantic City. Located on this road are the small town of Audubon where I was born, Hammonton where Reno Farinelli, Sr. produced Packard Shutters for many years and Egg Harbor City where Star Camera is located. Kind of makes one wonder.